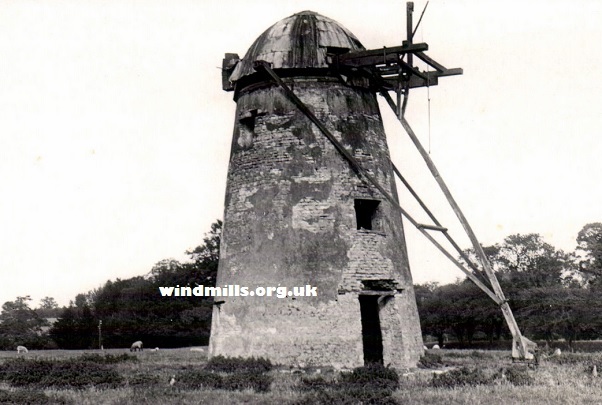 A photograph of the windmill in Sharnbrook as it looked in 1929, forty-nine years after it was built. The tower mill in Sharnbrook, Bedfordshire, England, was erected in 1880 and stopped working only ten years later. By 1920 the sails had been removed and the mill was in a somewhat derelict state. The photograph above shows the condition the windmill was in when photographed in 1929. The mill was converted to living accommodation and the cap removed and replaced with an observatory of sorts in around 1970. A house has been built next to the tower and the entire property is in private ownership. This entry was posted in Old Images, Windmills and tagged Bedfordshire, Sharnbrook, Sharnbrook Mill, windmill on November 19, 2015 by Tower Mill.